Variable Refrigerant Flow (VRF) - Diversified Piping & Mechanical, Inc. Variable Refrigerant Flow (VRF) is a method of providing precise comfort control to indoor environments that is both energy-efficient and cost-efficient. 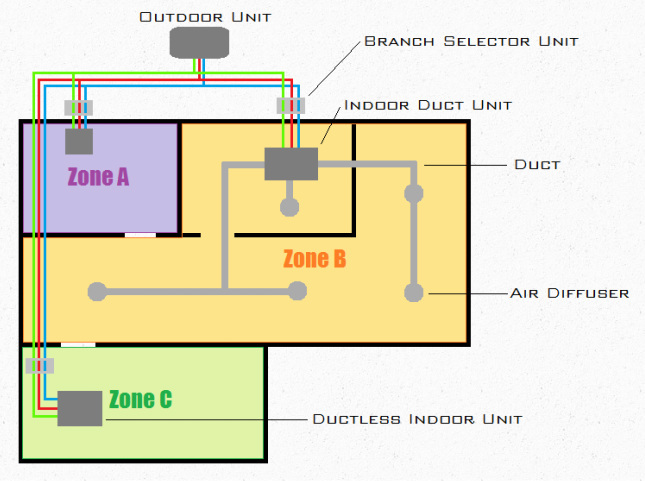 Ducted systems can be installed to heat or cool many rooms at once; ductless units can be installed in each room, allowing you to more precisely control the temperature of each individual room; or a combination of ducted and ductless can be used to control the climate in multiple zones. A zone is simply a space that is operated independently from the rest of the building and can consist of multiple areas or a single room. Most VRF systems consist of an outdoor unit, branch selector units, multiple indoor units, and corresponding system and zone controllers. Refrigerant piping connects the entire system, which saves significant space and allows for a clean, simple design. The piping from the outdoor unit connects to each branch selector unit on its way to the indoor units. Each indoor unit is connected to a sophisticated programmable controller that communicates with the system to tell the outdoor unit how to manage refrigerant flow to meet the climate requirements of each zone. VRF systems use copper refrigerant piping to connect the system rather than ducts or steel pipe. Therefore, the system takes up much less space than conventional methods of climate control. Now, rather than running ducts throughout the entire building, duct work can be limited to the indoor units you would like to branch off of to combine multiple rooms into a single zone. A VRF system moves refrigerant to the room or rooms to be heated or cooled. This enables you to simultaneously heat some rooms while cooling other rooms. VRF offers a wide variety of applications from spot-cooling or heating a single room in a home using a split-ductless system to a large commercial building with multiple floors and areas that require individual comfort control delivered by a split-zoning system.